When Sam Calagione from Dogfish Head asked us to provide a recipe for their book we jumped at the offer. Our own Chris Graham brewed this recipe with Sam and used that brew for the step by step brewing guide in the book! 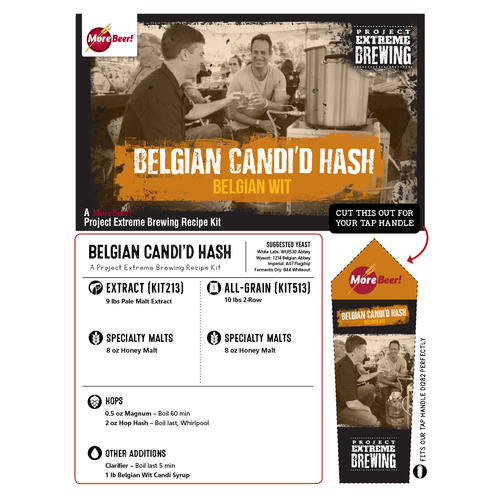 Belgian Candi'd Hash is so simple that even the most inexperienced brewer will have no trouble nailing this recipe. But don't let its approachability fool you, this is still an extreme brew! 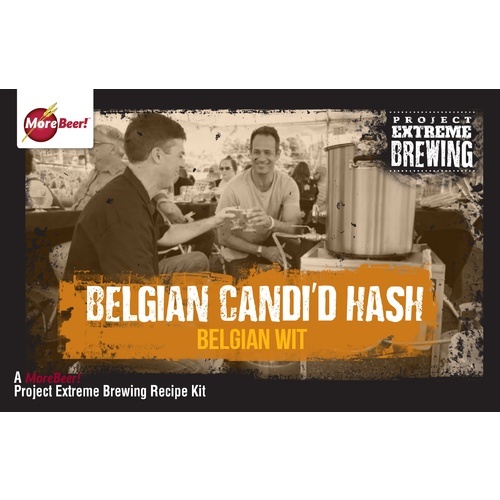 The addition of Belgian Wit Candi Syrup gives this beer tantilizing notes of orange peel and coriander, while hop hash contributes an incredible aroma and intense flavor that's hard to match with pellet or whole leaf hops. This hoppy Belgian Wit is the perfect beer for your induction into the subculture of Extreme Brewing. Blowed the lid of the carboy. Brewed this beer two weeks ago. Just keg today. Fermented out at abv 6.5. Oreginal gravity was higher than instructions called for. 1.062. Will wait for it to age for several weeks the carb it and see how it tastes. Hopefully it’s good.